where λ – thermal conductivity, qV – power density of the internal energy sources, Т – temperature, - Laplacian operator. Figure 1.1 Discretization of a solid body into elementary volumes (а), and a set of such volumes along the x-axis (б). Figure 1.1a shows a solid body discretized into elementary volumes of dimensions Δx, Δy, Δz. 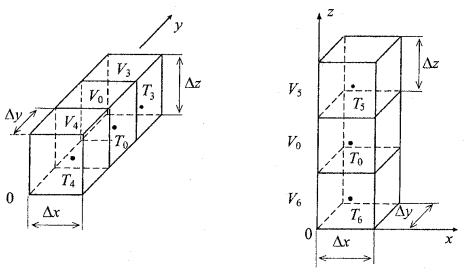 Consider a set of elementary volumes along the x-axis consisting of the volume V0 and the two adjacent volumes V1, V2, as shown in figure 1.1б. Denote the temperatures at the center of each volume Т0, Т1, Т2 (assume that the volumes are isothermal). Volume V0 contains internal energy sources with the power density q0. Figure 1.2 Two sets of the elementary volumes along the y- and z-axes. where Q0=q0 ·Δx · Δy · Δz – thermal power dissipated in the volume V0. Figure 1.3 Equivalent electrical circuit representing the steady-state heat transfer in the elementary volume V0. The finite-difference equation (1.8) describes heat transfer in the elementary volume V0. Figure 1.3 shows the electric circuit analog of equation (1.8) based on the Kirchhoff’s first law for the sum of currents at the 0-th node. Let’s consider now a boundary volume along x-axis (volume V1 in figure 1.4). As can be seen in the figure, this elementary volume is located outside the solid body; it is located in the environment surrounding the body. Step Δх outside the solid body is introduced artificially. Figure 1.4 Boundary elementary volume V1. where λГ is not the thermal conductivity of the isotropic body but the conductivity of the interval which includes the boundary between the body and the surrounding medium. In the experimental analysis of the heat-conducting properties of an interface, when trying to determine the law of heat-exchange between the surface of the body and the environment, the quantity known as the heat transfer coefficient is determined, α = λГ/Δх. Various boundary conditions can be specified at the body-environment interface. where xп, yп, zп - coordinates, τ - time (for steady-state τ is excluded). The boundary conditions of the first kind cannot be specified during the design stage because the design is not yet implemented and the temperatures of the boundary surfaces are not yet experimentally determined. Such boundary conditions occur on the boundaries between the components of the electronic assembly and the surrounding air. where G’x= α · Δy · Δz - thermal conductance of the surface in contact with the surrounding medium. Figure 1.5 shows the electric circuit analog of equation (1.5) based on the Kirchhoff’s first law for the sum of currents at a node (in the figure, node 1 represent surface of the body). Figure 1.5 Equivalent electrical circuit representing the heat transfer in the boundary elementary volume with the specified boundary conditions of the second kind. The difference between (1.13) and (1.12) is that the temperature Т1 is known and equal to Тср. Figure 1.6 shows the electric circuit analog of equation (1.13) based on the Kirchhoff’s first law for the sum of currents at a node. Figure 1.6 - Equivalent electrical circuit representing the heat transfer in the boundary elementary volume with the specified boundary condition of the third kind. Boundary condition of the fourth kind specifies the temperature or its gradient at the boundary between the two media. Such boundary conditions occur on the boundaries between two media with different conductivities. For example, the boundary between a semiconductor component and a heat sink, transformer and packaging, two connected components of the assembly, etc. Figure 1.7 Boundary between of two solid bodies with different conductivities. where λ0 Г1 is the conductivity of the interval which includes the body with conductivity λ1, body with conductivity λ2, and the boundary between them. Figure 1.8 - Equivalent electrical circuit representing the heat transfer in the elementary volume located at the boundary between two solid bodies where the boundary conditions of the fourth kind is specified. where - thermal conductance between two solid bodies. 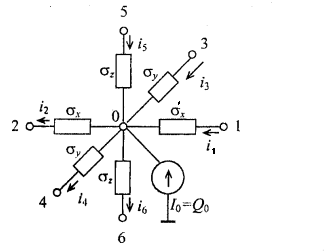 Figure 1.8 shows the electric circuit analog of equation (1.15) based on the Kirchhoff’s first law for the sum of currents at a node. If the thermal contact between two solid bodies is assumed to be perfect, the temperatures of the boundary volumes is taken to be equal, i.e. Т1=Т0. 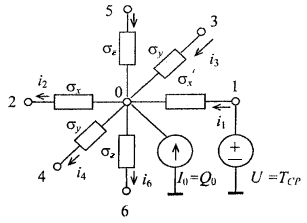 Figure 1.9 showstheelectriccircuitanalogofequation (1.16) basedontheKirchhoff’sfirstlawforthesumofcurrentsatanode. Figure 1.9 - Equivalent electrical circuit representing the heat transfer in the elementary volume located at the boundary between two solid bodies with perfect thermal contact. Thus, the heat transfer in a solid body with boundary conditions of any kind can be modeled by the equivalent electrical circuit. Using these elementary heat transfer models with appropriate specified boundary conditions, the electro-thermal analogy can be extended to model thermal processes in the electronic assembly. The models of thermal processes (MTP) are based on the following analogies: voltage at a node of an equivalent electric circuit is equivalent to the temperature at that node, electric conductivity - thermal conductivity, electric current – thermal flow, current source directed into the node – heat capacity rate, current source directed out of the node – heat absorption capacity, voltage source – specified temperature of the corresponding part of the electronic assembly. Following this approach, the electronic assembly is subdivided into volumes which are small enough to be considered isothermal. Representation of the assembly by a set of thermal conductances between such volumes, results in a large scale equivalent electric circuit. This circuit can be analyzed on a computer using the methods of electric circuit analysis. where Ср – specific heat capacity, J/(kg·К); ρ – material density kg/m3. where С0 – heat capacity of volume V0. Figure 1.10 - Equivalent electrical circuit representing the non-steady-state heat transfer in the elementary volume V0. This function is defined for some time interval Δτ, during which the thermal processes are being analyzed. To facilitate the analysis of the thermal processes in the electronic assemblies, it is convenient toforma topologicalrepresentationof thermal models. Topological model is a model represented in the form of an undirected graph. 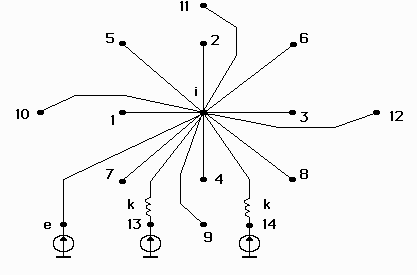 In the MTP, vertices (nodes) of such a graph represent structural elements and components of the electronic assembly (heated zones). Branches (edges) represent thermal flow. Nodal variables are computed temperatures (Тi), variables of the branches – heat flux (Ψij), and parameters of the branches – thermal conductance (Хij). In general, two types of branches can be identified in the non-steady-state heat flow analysis: 1-st type – dissipative branches where the values or analytical expressions of the thermal conductance (Xij) are known; 2-nd type – conservative branches where the values or analytical expressions of the heat capacity (Cij) are known. Unlike in other models, in topological thermal models boundary conditions of any kind and combination can be easily specified with the help of the corresponding components of the graph (branches, specified temperature sources and/or sources with specified thermal power). Other advantages of the topological model are: relatively simple transition to other mathematical models; the ability to use general methods for formulating and solving mathematical models, including the theory of sensitivity. 1. Parts which describe thermal processes in the element without taking cooling into account (boundary conditions). 2. Parts which take cooling into account. Parts of the MTP of the first type represent thermal models of the structural components (printed electronic parts, function cells, electronic parts without packaging). These models can be easily obtained by using the finite-difference approximations of the heat transfer equation. It should be noted that such approach makes it possible to form parts of the MTP with different level of detail. Such parts can be used in different stages of the design, using hierarchical approach. When analytical model are used, computation of the parameters of the MTP is based on the geometrical and thermo-physical parameters of the structure; therefore, any feature of the structure can be taken in to account. Parts of the MTP of the second type represent boundary conditions of the 1-4 kind and their combinations. They are expressed through geometrical and thermo-physical parameters of the structure and thermo-physical parameters of the surrounding environment. Among various thermal processes occurring in the elements, simple forms of heat-exchange can be identified and used to construct topological models of the thermal processes (MTP). For clarity of representation, graphic images of the topological branches can be introduced with original designations assigned to the components of the graphs. There are many ways to assemble various electronic components. Some assemblies, however, can be identified as less efficient at protecting the terminals of the components against mechanical vibrations. Although any mechanical effect can cause time-varying loadings in the terminals, fatigue-failure is mainly caused by the long-term cyclic loadings such as harmonic and random vibrations, and acoustic noise. Comparing to these loadings, short-term loadings such as impact and linear acceleration do not contribute much to the fatigue accumulation. Therefore, it is necessary to develop models of the components subjected to vibrations and noise. To determine dynamic characteristics of an electronic assembly two problems have to be solved: the first one determines natural frequencies and forms of vibrations of the structure, and the second determines the amplitudes of the forced oscillations of the components at different locations in the assembly under specified external vibration (load). It is then possible to determine mechanical loadings and strength tolerances of the structure and assess the probability of non-failure under vibration. In practice, the applicability of the analytical methods for solving such problems is very limited. Modern electronic assemblies represent complex mechanical systems with numerous elastic and rigid connections. In addition, various elements of such a system are often joined together in a fashion that is not standard for structural mechanics. Moreover, elements of the assembly are often mechanical structures themselves, which can resonate and, therefore, significantly increase mechanical loadings. It is difficult to create an analytical model which is simple and, at the same time, sufficiently accurate to represent physical and dynamic properties of such a mechanical system. A number of mathematical difficulties usually arise when trying to establish and solve the equations of motion of such a structure. Therefore, dynamic properties of the electronic assemblies are usually on a computer using numerical methods. The Finite Element Method is one of the most effective methods for solving problems which involve complex practical structures. Over the years it became one of the most popular and wide-spread techniques. Nowadays, there exist many software packages based on the Finite Element Method. Among them, ANSYS is one of the most versatile. Advanced programming algorithms of this package allow significant automation of the process of the component design and their discretization into finite elements. The analysis of vibrations in electronic circuit boards is often based on the Kirchhoff–Love theory of plates. The assumption made in this theory is the following: all straight lines normal to the mid-surface of the plate remain straight and normal to the mid-surface after deformation. Thus, the coordinate along the thickness of the plate can be excluded from the model. where i=1,2,45; - logarithmic decrement of damping; - Poisson coefficients of the material along x and y directions and at an angle of 45, respectively (x and y axis coincide with the sides of the PCB); - external force per unit area causing oscillations. To use this equation for modeling mechanical processes in a PBA subjected to vibrations, impacts, linear accelerations and acoustic noise, the following two criteria should be satisfied. where - angular frequency of oscillations; - material density. Let’s substituting the values of for the printed circuit board made of the epoxy glass laminate sheet. The values which maximize the left-hand side are: . Then, the left-hand side is equal to 0.013<<1. Using the same values for , and , , the left-hand side is equal to . Thus, equation(2.1) can be used to model themechanical processes in the PBA for all types ofmechanical effects,whose spectrumlies within2000 Hz. The following sections present models based on (2.1) which describe PBAs subjected to harmonic and random vibrations, impact, linear acceleration and acoustic noise. Both, analytical and finite-difference models will be considered. The former are used for the assemblies with uniform arrangement of the components whereas the latter are used for the arbitrary arrangement. where i – amplitude of the vertical displacement at point i. Figure 2.1 shows sketch of a PBA with the superimposed uniform rectangular grid. The step size of the grid along x and y directions can be different. Figure 2.2 shows numbering of the nodes surrounding some node i.
where a and b – step-size along x- and y-axis as shown in figure 2.1; - vertical displacements of the PCB from the equilibrium at the points 1,…,12, located around node i as shown in figure 2.2. 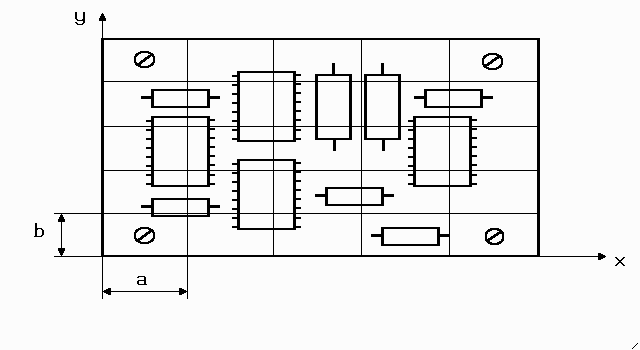 Figure 2.1 Sketch of a printed circuit board with superimposed grid. 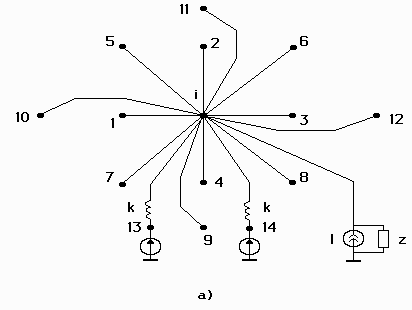 Figure 2.2 Topological model of a PCB subjected to harmonic vibration. The model also takes into account temperature. where - mass of the i-th node per unit area. where and - grid steps along x- and y-axis; - mechanical loss coefficient of the support material (constant, because support usually oscillates at frequencies far from resonance); - rigidity of the PCB supports under tension. In this model, the temperature is taken into account thorough the temperature-dependent parameters - modulus of elasticity (cylindrical stiffness) and mechanical loss coefficient. In the topological mechanical model of the PCB, these dependences are represented by adjustable elements - resistors and inductors. As can be seen from (2.6), any -th node in the topological model should be connected to 12 surrounding nodes (see figure 2.2) and one common node (ground) with zero potential (in figure 2.2 this node is denoted as a solid thick line). Dashed lines in figure 2.2 represent branches in the topological model. Moreover, if the i-the node represents the PCB support, it should be connected to the e-th node. Figure 2.2 also shows electrical equivalent representation of the conservative ( ) and dissipative ( ) components. Each i-th node is connected to the common node by a branch with conservative parameter . The right-hand side of equation (2.6) is zero for all nodes except the onces which are connected to the e-th node, that is PCB support. where - discretization step in time; - total time during which the random process is active; - number of discretization points. where - instantaneous vibration displacement of the base. Since vibration acceleration is usually specified, vibration displacement is found by integrating the acceleration twice. This integration is done numerically because the acceleration can be a very complex function of time. - mass of the i-th node per unit area. Expression (2.13) contains artificially introduced frequency . 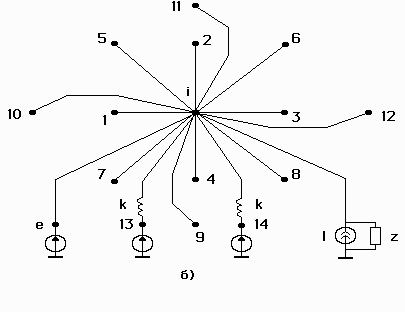 In the topological model, it represents frequency of the alternating current in the circuit. 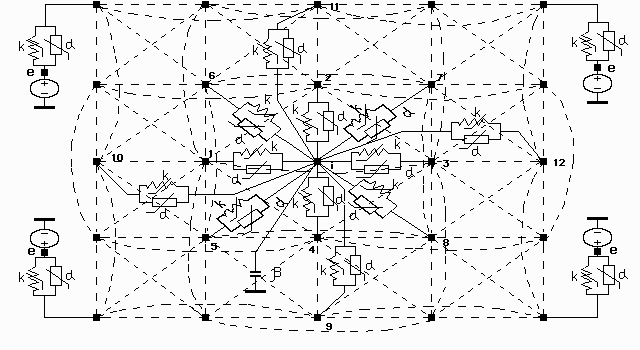 The time domain topological model of the PCB, which includes temperature, is almost identical to the model with harmonic vibration shown in figure 2.2. The difference is the addition of the branches (see figure 2.3) from nodes 13 and 14 and the exclusion of the branches connecting each i-th node to the common node. As a result, in the time domain models there exist 3 time layers; whereas, model in the frequency domain are discretized only in space coordinates. In addition, the parameters and , as can be seen in figure 2.3, are independent of temperature. During the simulations, displacement is determined. The acceleration is found by taking the second time derivative of displacement. This differentiation is done numerically because the displacement can be a very complex function of time. Vibrations with multiple harmonics, impact and linear acceleration can be defined as a single instance of the random process. Therefore, models of the PCBs subjected to these loadings can be realized as the model of the PCB under random vibration based on the finite-difference method and described by expression (2.13). 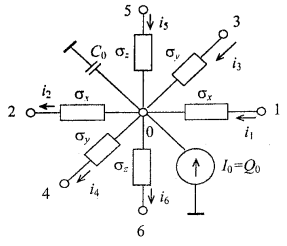 Figure 2.3 Topological model of the printed circuit board subjected to random vibration. The model also takes into account temperature. where - uncorrelated normally distributed random variable whose variance defines the spectrum of the random function and the standard deviation is the specified acoustic pressure. where - source current. If the node is not connected to the support, . 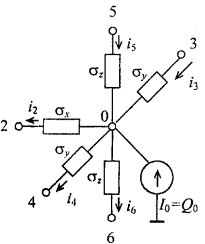 Thus, unlike in model (2.13), each i-th node is connected to the common node by a branch with the current source which has internal impedance (see figure 2.4а). 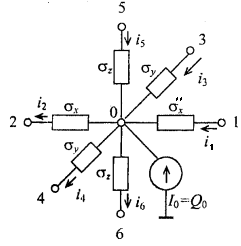 For the nodes connected to the PCB support, the topological model is shown in figure 2.4б. 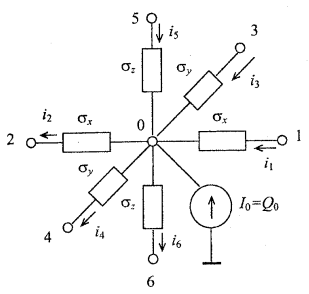 Figure 2.4 Topological model of the printed circuit board subjected to acoustic noise. The model also takes into account temperature. 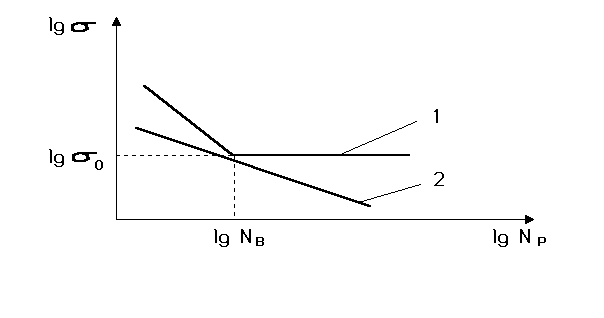 n – number of factors. Correction coefficient = kλ1kλ2kλ3kλ4 kλ5 is always greater than one. It indicates that the number of failures can be much greater when the equipment is operated under real-world conditions than when it is operated in a laboratory. Coefficient kλ1 represents mechanical factors (vibrations, impact), kλ2 – environmental factors (temperature, humidity), kλ3 – operation in low atmospheric pressure, kλ4 - biological factors, kλ5 – effects of specific environments. Values of these coefficients can be found in the reference books. – number of factors for the j-th constituent part. – nominal power of the resistor, W.
– correction coefficient taking into account the operating conditions in standby mode (storage). where - probability of the non-failure operation of the i-th component. where - failure rate of the system. The reliability of a redundant system depends on the mode of operation of the duplicate components. where – reliability of the i-th device; m – number of devices in parallel connection (main + duplicate), – failure rate of the i-th device. where and – failure rates of the main active device and the i-th backup, respectively. where and – failure rates of the active element and the switch, respectively. where - number of cycles before failure; f – frequency of vibrations. where - fatigue limit; m – parameter which depends on the material, size, and shape of the terminals; - basic number of cycles; - maximum mechanical stress in the terminals. where - standard deviation of stress; - variance; - reduced spectral density; - spectral density; - gamma function; - angular frequency of the harmonic loading ; and - parameters of the fatigue curves where ; - stress amplitude in a cycle; - minimum mechanical stress in the terminals. To use the abovementioned formula for the computation of the time to fatigue-failure in the terminals of the components, it is first necessary to compute mechanical stresses in the terminals. Currently, this is done using the Finite Element Method. Parameterm represents the inclination angle of the fatigue curves. Figure 3.1 shows two experimentally obtained fatigue curves, also known as Wohler curves. They describe the relationship between the stress amplitude and a number of cycles to failure. Curve 1 is for steel of low and medium strength as well as titanium alloys without corrosion and at normal temperature, curve 2 – non-ferrous metals and high-strength alloyed steel. Curve 1 has a sharp bend at cycles, after which it is almost parallel to the abscissa. Therefore, as a basis for tests is usually assumed. Physically, it means that if the stress amplitude is less than , no number of cycles will cause fatigue-failure. This value of stress is called the fatigue limit. Some materials, in particular non-ferrous metals, do not have a distinct fatigue limit: as the number of cycles increases the strength continues to drop (curve 2). For such materials, fatigue is characterized by the finite life threshold (endurance threshold) for a given number of cycles , which is usually taken to be 5*107 cycles. This fully applies to the terminals of electronic components because they are usually made of the non-ferrous metals and their alloys. Analysis of the thermal modes of electronic assemblies shows that the temperatures at the component terminals do not exceed 150С. Fatiguecurvesfornon-ferrousmetalsand,consequently,parameter , begintochangesignificantlyattemperaturesabove 0,45 - 0,50 Tпл (Tпл – melting point of metal) which, for example, for copper is about 500 С. For othernon-ferrous metalsand alloys, this temperature is either of the sameorder orexceeds it.Thus, theeffect of temperature onthe slope of the fatigue curves for the materials of the terminalscan be neglected. However, temperature plays important role in the mechanical processes occurring in the components. The mechanical effects are transferred to the components through various packaging elements – cabinets, supports, blocks, PCA. Therefore, the effect of temperature on the mechanical processes in the electronic components is accounted for by including the effect of temperature on the supporting structure. An originalmethod for determiningthe residual lifeof the components was developed. It allows us to take into account the fluctuations inthe electrical characteristics of the circuits, ambient temperature, and the temperatures of the components. where — failure rate in laboratory conditions; – correction coefficient of the k-th factor at time , m – number of factors. where - failure rate of the electronics.